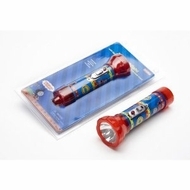 Tin embossed flashlight Features a siren whistle, a Morse Code flash button and key chart Requires 2 C batteries, not included. Comes blister carded. Light has Morse code flash button and includes a code sheet.